If you are an artist trying to make a side or full income by selling your craft, there is another art you will first have to master and that is the art of pricing. If you analyze the trend any skilled trade you will undoubtedly notice a pattern. The more experienced the trades-person becomes in their craft, and the more skilled their work, they more they get paid. Are YOU the artist any different? Surely you have invested your heart and soul, along with hours crafting and learning in order to be where you are today. 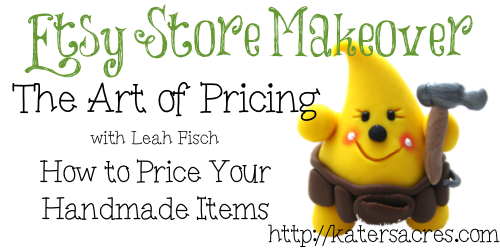 There is so much more to pricing handmade artwork than simply doubling the cost of material. Every artist is different, and so every pricing formula should be different. My goal is to give you a simple foundation so that you can derive YOUR ideal pricing formula which creates a balance between earning and income and providing value to your buyers. If your labor involves large chunks of time, mark the start and end time including any cleanup and preparation. If you work in bulk on smaller pieces, price your hour and then divide by what you create. Any supply or material that is used up in your art process should be added into your material cost. The obvious ones include canvas and paint for a painter and clay for a sculptor. Using my merbaby sculpture as an example again, I used an overhead lamp and sculpting tools. He was baked in a convection oven, and finished using painting supplies. I have also invested in a number of sculpting book. While these are not used up they are still art-related costs. I recommend using a formula like this one for full-time artists, and an adapted version for part-time. Yearly cost of overhead divided by 12 months for a monthly overhead cost. Then divide the monthly overhead by an approximation of how many pieces you can product each month. The above numbers are the minimum criteria you want to consider when determining your WHOLESALE pricing. Meaning the absolute lowest you want to sell to break even for your time and material. Converting from wholesale to retail pricing can be done in a number of ways. Perhaps you sell directly and prefer to keep your items priced low, or perhaps you sell through consignment or other retailer, again these are the lowest prices you should accept in exchange for your work. Some recommend multiplying wholesale by 2 or 3 for a retail value, while others feel these numbers are too high. A quick personal story on pricing for the weary. When I first started on Etsy I wasn’t getting sales, and so I lowered my sock monkey sculpture ($30 value) to $0.99 and it sold. After doing the math I realize that I paid to buyer to adopt my sculpture and not the other way around. And so I gingerly raised my numbers to wholesale. Well guess what, they sold! Prior to the holiday shopping season I boldly raised my prices to retail thinking there was no way, and you know what, I don’t think my sales volume dropped at all. When a buyer recognizes a piece of handmade art for what it is, they should be willing to pay what it ís worth. In doing so I was able to work less, (sell less) and make the same profit. This extra free time can then be devoted to generating qualified traffic and building backlinks to my shop, a topic Katie covers quite nicely in her Build Your Brand series. Read Etsy’s advice on pricing your handmade item(s) here. A note from Leah: I ran into Katie from KatersAcres soon after opening my Etsy shop. Katie has been a role model and inspiration in both her mannerism, willingness to help out a fellow PC sculptor, and with the great information found on her blog. I am honored to have an opportunity to share some of what Iíve learned with the fans and followers of this blog. Thank you so much for this post! This certainly is helpful! Thank you for this post! I’ve been doing a lot of math to figure out how to price my charms and the wholesale numbers don’t terrify me too much, but retail certainly does. I like your comments about how you managed to gingerly raise your prices from wholesale to retail prices as I’m considering I may do a similar strategy, so it’s definitely nice to hear that it can be done successfully! I’m glad you found this helpful! Good luck in setting good, fair prices that reflect your time & value as an artist. Great post! Thank you for showcasing another talented artist on Etsy and for sharing the information! Why does no one run any numbers on pricing photography? I find it very hard to price!l especially with so many variables.